This isn’t really a post about maps, but it all started with a map. 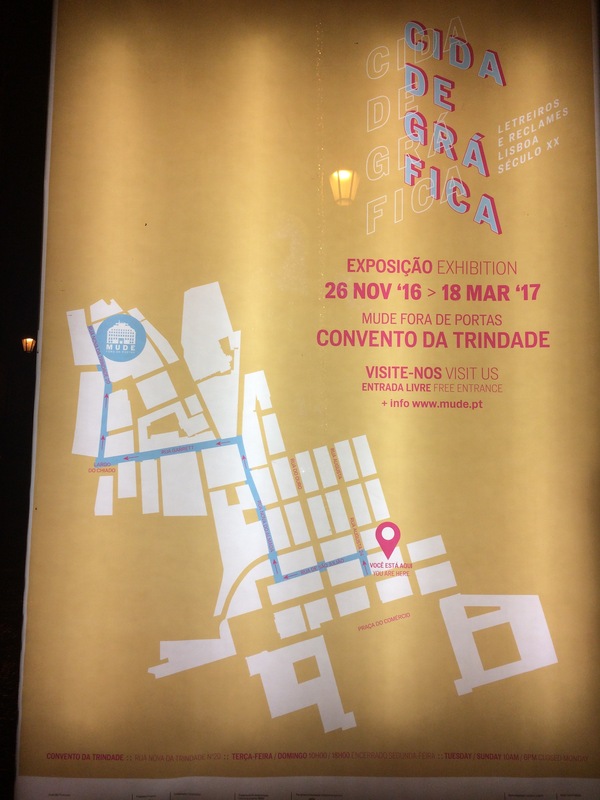 You could say the topic is related to wayfinding, but mostly it’s about a great design exhibit, one you shouldn’t miss if you are in the area. 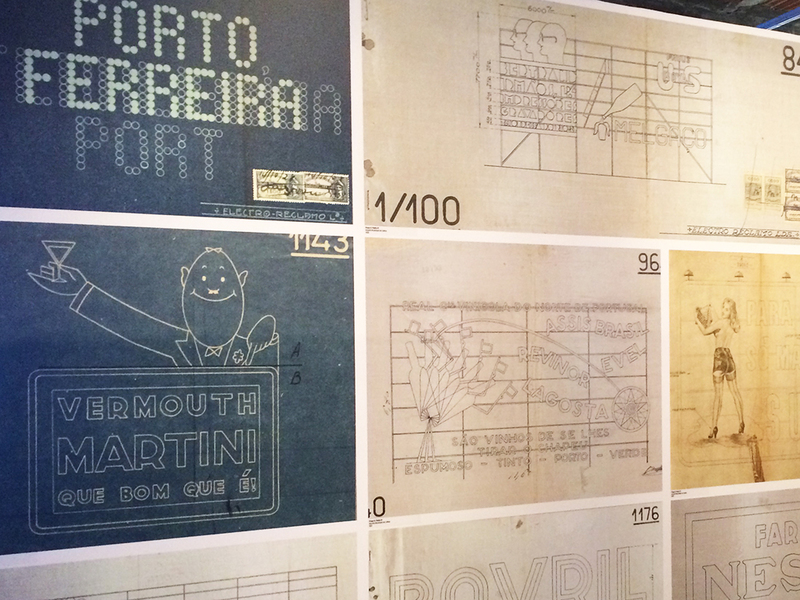 I had heard there was a design museum in Lisbon, but it turned out it is closed for renovation. As we were out sightseeing, we saw a map for the museum, with a big blue arrow creating a path to the temporary exhibit. I took a photo for future reference, and came in handy when we were looking for the location. Lisbon, like many other cities, has been removing old signs due to changes in tenants, renovations to buildings and business districts and general disuse. 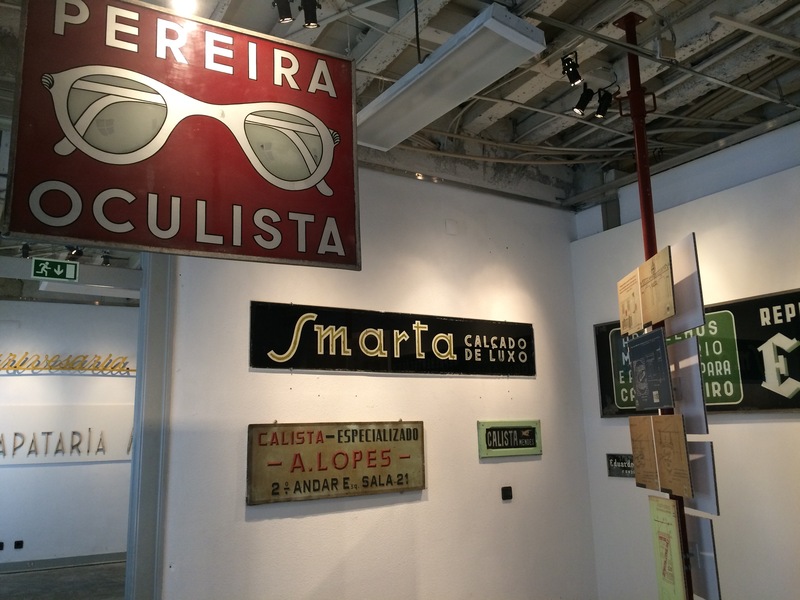 Two Lisbon designers, Rita Múrias and Paulo Barata, had the foresight to save these signs as cultural and graphic artifacts of the city and the times in which they were used. 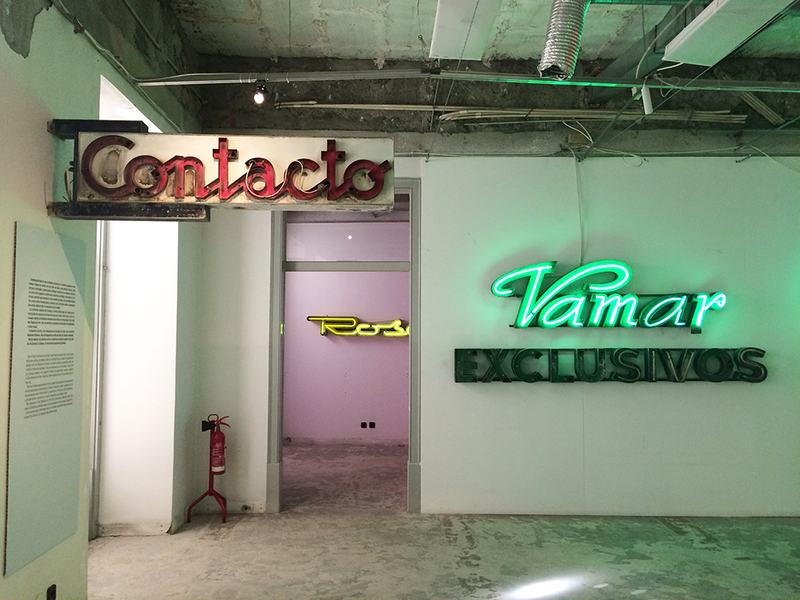 There were two floors, each highlighting a different material, are crammed with great old signs. First were handprinted signs, the oldest examples. Here almost every square inch of windows and jambs was used to let the public know what was inside the store. They even recreated one a handpainted store front sign for the exhibit, at full size. Moving on, actual lightbox and fabricated signs were displayed. These were wonderful to see up close. You could see the thin post that held the dot on the shaft of the “i”. You could see in one example how a letter changed in depth to accommodate the change in the building facade. Neon was the highlight of the exhibit. As you moved through each room, the signs got larger and larger. They had letters from the huge signs that used to be on the tops of the buildings in Praça D. Pedro IV (aka Rossio Square, a major square in the central city). The exhibit explains this was a popular area in which to stroll at night, due to the abundance of neon lights and signs. 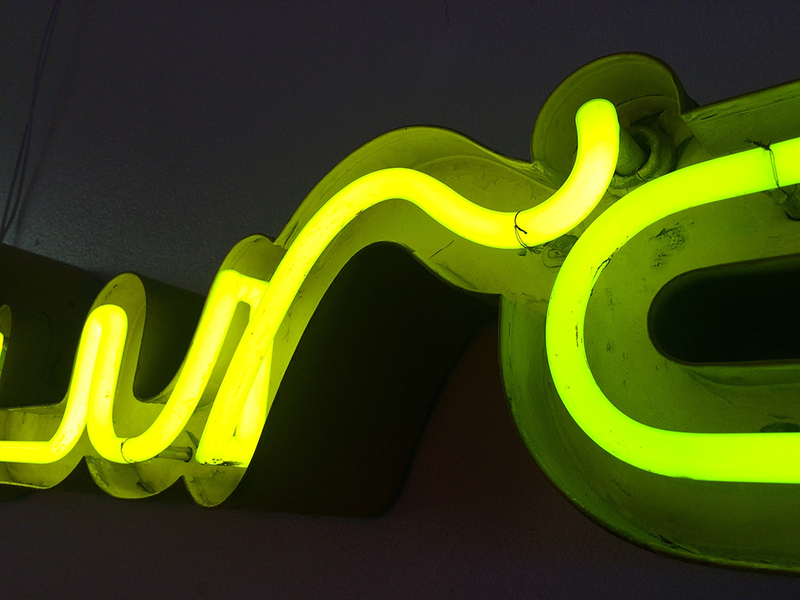 Up close and personal with neon. My fascination with signage is due to having designed architectural signage in my career. When I go to an art museum, I look at the signs, as well as the exhibit. It was fabulous to see these signs up close. You could see how each letter was fabricated and installed. You could see the layers of wear and age. In addition to the signs, somehow they had found several working drawings, some for fabrication, some for approval by various city departments and some for installation. There is even a full size template for creation and installation of the blue neon tube for the 6ft high “Z” and “R” of the the “RITZ” sign. They are complete with approval signatures and red pencil corrections. I’ve drawn these types of drawings before, and seeing them gave me a higher level of appreciation for the exhibit. The drawing in the center shows an animation for neon. 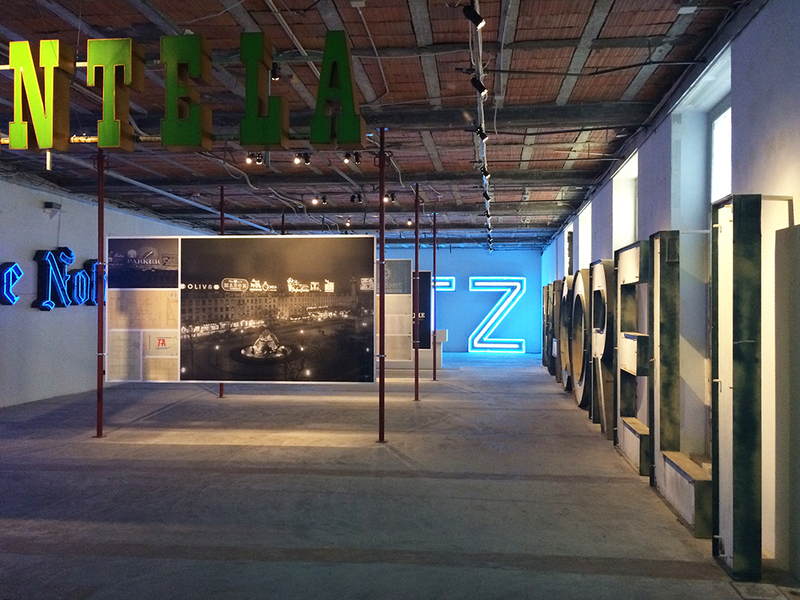 The temporary space lent itself to the exhibit. An old convent played host, but it looked more like a typical abandoned building. The only giveaway it had been something special was the blue and white Portuguese tile that ran up the stairwell. The exhibit was in warren of rooms, rooms within rooms, as if each sign was a discovered treasure. Light leaked in from windows and it all had a bit of an eerie abandoned feeling. The only thing that was missing was a flickering letter or a buzzing sound. These are the actual illuminated signs from the tops of the buildings, as shown in the accompanying photos. This exhibit was a great find. I would recommend if you are in the area before March 18, 2017, find the convent and go. You can use the map in my photo! Click on the images for captions and larger views.